Due to the semi-convex shape of the durable polymer pad, air is given off with a wide emission angle across the entire white filter surface. Low pressure aeration or fluidisation prevents rat-holing, bridging, segregation or material residues at the bottom of the silo cone. 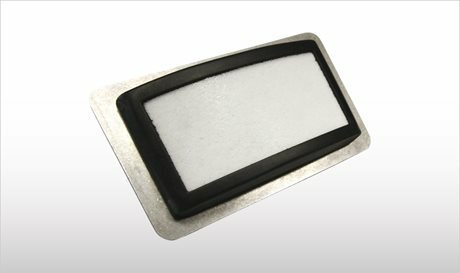 I100 Aerator Pads excel through a lightweight, yet robust and reliable engineering polymer casing and filter design. In a single row installation, they are widely used for materials such as cement and similar materials. More sophisticated applications with alternately fed multiple rows can be used for lime storage and dosing plants in which fluidisation is used not only during discharging of the silo but also to keep the material in motion during extended periods of storage. A rectangular, external mounting kit is available for easily fitting or retrofitting batching plants. Operating pressure amounts to 0.2 bar (3 PSI).